Sunspots Today: A Cheshire Cat – New Essay from Livingston and Penn | Watts Up With That? Physical conditions in the infrared at 1.5 microns, including maximum magnetic field strength and temperature, have been observed spectroscopically in 1391 sunspots 1990 to 2009 (1). We emphasize the quantitative difference between our IR sunspot measurements and the visible light results from most solar magnetographs employed world-wide. The latter are compromised by scattered light and measure flux, not field strength. A lower limit of ~1800 Gauss is required to form spot umbra. The umbral maximum field strength has declined over the above interval, perhaps because spots have on average diminished in size. The present condition of solar activity minimum has more spotless days than since the 1910s (2). The Cheshire Cat behavior is related to magnetic surface fields often appearing without accompanying dark spots. Sunspots recently are behaving like a Cheshire Cat: the smile is there (magnetic fields) but the body is missing (no dark markings). We are unsure about past cycles but at present sunspots, with their usual umbrae and penumbrae, are failing to materialize. For hundreds of years the Sun has shown an approximately periodic 11-year alteration in its activity where the number of sunspots increases and then decreases. Sunspots are dark regions on the solar disk with magnetic field strengths greater than 1500-1800 Gauss. The last sunspot maximum occurred in 2001. 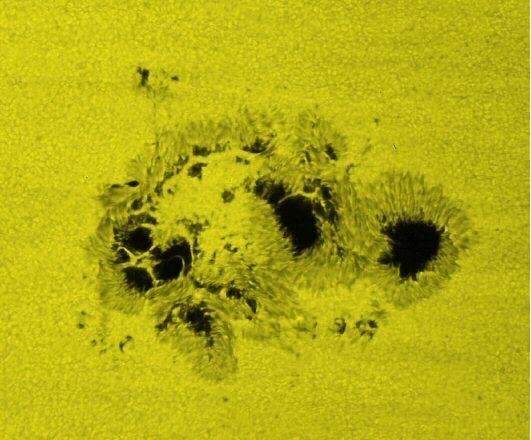 Magnetically active sunspots at that time (Figure 1A) produced powerful flares, caused large geomagnetic disturbances, and disrupted some space-based technology. Figure 1a. An image of a sunspot from near the maximum of the last solar cycle, cycle 23, taken at the McMath-Pierce telescope on 24 October 2003. The sunspots clearly show a dark central umbra surrounded by a brighter, filamentary penumbra. The magnetic fields seen here range from 1797 to 3422 Gauss. Figure 1b. An image of a pore – a tiny sunspot with no penumbral structure – taken from the MDI instrument on the SOHO spacecraft, 11 January 2009; this is an example of what we observe today at solar minimum. The larger pore had a magnetic field of 1969 Gauss. Presently, the solar surface is mostly devoid of spots. Both images have the same spatial scale, and are roughly 360 Mm horizontally. happened before. Others sense abnormality. Figure 2. Number of spotless days at cycle minima in the past. Why is a lack of sunspot activity interesting? During a period from 1645 to 1715 the Sun entered an extended period of low activity known as the Maunder Minimum. For a time equivalent to several sunspot cycles the Sun displayed few sunspots. Models of the Sun’s irradiance suggest that the solar energy input to the Earth decreased during that epoch, and that this lull in solar activity may explain the low temperatures recorded in Europe during the Little Ice Age (3). In 1990, working with S. Solanki, we began exploratory measurements at the McMath- Pierce telescope of the infrared magnetic field strength, temperature, and brightness in dark sunspot umbrae. These observations use the most sensitive probe of sunspot magnetic fields: Zeeman splitting of the infrared spectral line of Fe I at 1565 nm. This splitting yields total field strength not flux (see below). Because the splitting is always complete in sunspot umbrae the measurement is independent of atmospheric blurring, or seeing (providing the line is visible). Temperature was deduced from the depth of nearby molecular OH lines. Higher temperature meant brighter continuum intensity and weaker OH. Starting in 2000 this work became systematic, where each spot was measured only once at the darkest position in its umbra. The resulting data set of 1391 observations represents the longest time-sequence of total field strengths in sunspots. Figure 3 is a plot of these observations. Figure 3. 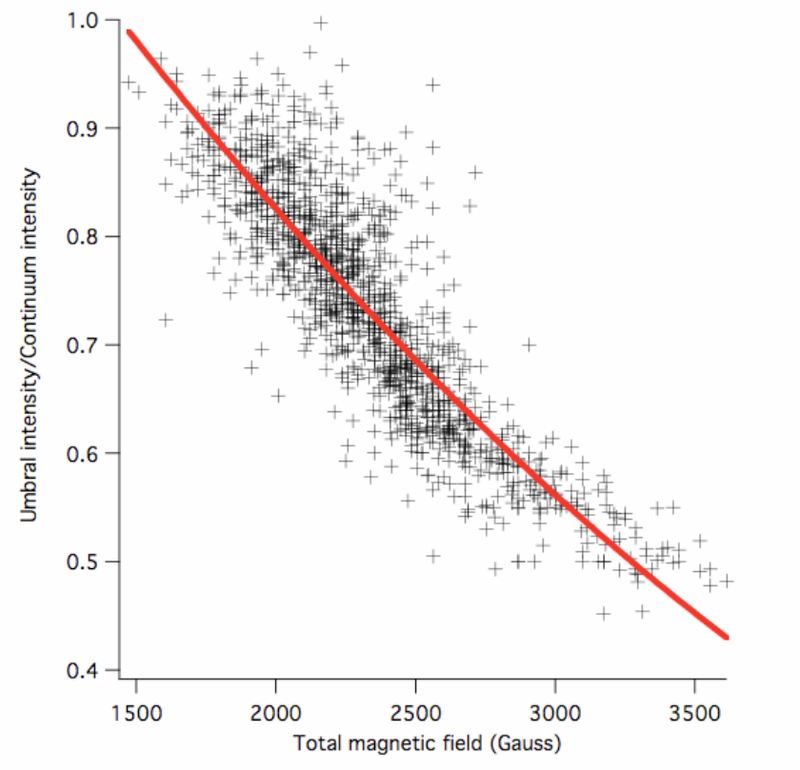 Maximum magnetic field vs. continuum brightness for all data 1990-2009. We believe most of the scatter is real; the errors are likely to be in intensity and not field strength. Sky transparency and image quality, or seeing, are of course somewhat variable and this affects intensity. Data with obvious clouds were discarded. Two conclusions: 1) there is not a unique relation between sunspot brightness and magnetic field and 2) the lower limit to the magnetic field to produce a dark marking is around 1500-1800 Gauss. This lower limit is uncertain because of noise in intensity (brightness) signals. It was also found that the magnetic field strengths in umbrae were on average decreasing with time independent of the sunspot cycle. Or it may be that spots are simply getting smaller (4). OH has practically disappeared today. A simple linear extrapolation of our magnetic data suggests that sunspots might largely vanish by 2015, assuming the 1800 Gauss lower limit, see Figure 4. Figure 4. The maximum sunspot total field strength is plotted versus time, during the period from 1992 to Feb 2009; a 12 point running mean is shown, and a linear fit to the data is made. Apart from a few measurements, the linear trend has been seen to continue throughout the present solar minimum. The brightness and magnetic fields of large sunspots had earlier been discovered to change in-sync with the solar cycle as seen by ground-based telescopes (5). Automated solar magnetographs (e.g. Mt Wilson, Kitt Peak, SOHO) measure surface magnetic flux using spectral polarization signals from the Zeeman effect. Flux measurements are subject to scattered light; the fields they deduce in sunspot umbrae are much less, often by a factor of two, than the field strength given by the Fe 1564 nm splitting (6). The latter does not involve polarization sensing. Magnetograph instruments, however, are in wide use both in space and ground-based –with a time span going back over 50 years. They do record non-sunspot magnetic flux (which the simple non-polarized Fe 1564 nm splitting cannot do) and have detected the onset of the next solar cycle active regions. This deduction is based on the expected high solar latitude hemispheric magnetic polarity reversal, the “Hale cycle”. Yet all new cycle number 24 spots that we have observed have been tiny “pores” without penumbrae (e.g. Figure 1). Nearly all of these features are seen only on magnetograms and are difficult or impossible to see on white-light images. Thus the analogy to the Cheshire Cat [Roberts, 2009]. Physical explanations of this deep minimum are at present speculative. Modelers invoke flux transport, meridional flows, and other subsurface mechanisms. Whether this diminished vigor in sunspots is indicative of another Maunder Minimum, remains to be seen. We should mention, too, that the solar wind is reported to be in a lower energy state than found since space measurements began nearly 40 years ago (7). Will the Cheshire Cat Effect persist? Fields and Temperatures, Astrophys. Jour., 649, L45-L48, (2006). During the Maunder Minimum, Geophys. Res. Lett., 19(15), 1591–1594 (1992). 6. Private communication from J. Harvey, (2009). International Astronomical Union, IAU Symposium, Volume 257, pp 109-120 (2009). Roberts, Harry, Sydney Observatory, private communication re. Cheshire Cat (2009). June 13, 2009 in Science, Solar. We only watch and wonder what is happening next with our sun. Thank you Anthony and Bill Livingston for the hot off the press update. Leif, What say you ? ?, esp. about figure 4 & the argument field strength will be too weak to support visible spots by 2015? If I understand this post we do not currently know what this activity of the Sun means, and, possibly we will know soon, and it won’t be pleasant. Also, I like that Fig. 4’s linear fit (the black line) stops where it does for, surely, what goes down sharply could reverse just as quickly. I wonder who will be the first to extend the line and post it? No one can predict because no one understands…the mysteries of our Sun. Thousands of demonstrators have rallied across Australia to demand greater government action to protect the environment from climate change. No no no, this article doesn’t hold water, it fails the most elementary test. The authors failed to mention that their conclusions confirm that currently perceived global cooling is non-existent and/or an aberration, a deceptive and false blip in the constant upward thrust of burning planet syndrome. Where is their confirmation that the Sun has minimal effect on the unprecedented searing temperatures? Where is their confirmation that a quiet Sun can only have one effect, namely to accelerate the warming of the plant? I think these gentlemen simply don’t understand the rules of the game. It’s great to get an update of this information – thanks for the post! 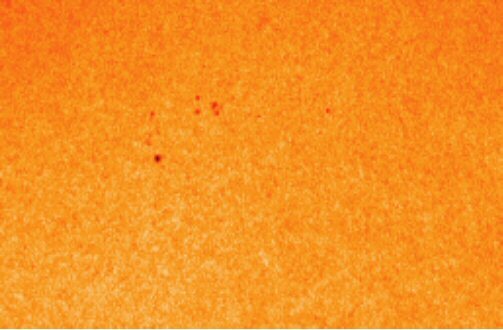 Love how the establishment astronomers are so desperate to see sunspots they are making specks out to be beams. Leif, given how the threshold of “what is a sunspot” seems to be dropping fast, and given your past revisionism of sunspot records based on individual astronomers practices, perhaps we need to adjust the past record to make a proxy record of past pore counts? Yes, you’re right… And the Sun is getting older and unpredictable each day. Solar cience is not settled… yet; at least not in the real world. Most of the spots we have seen this year are truly pores. A group called Ergebrisse has been calculating the “sunpores” in a more precise manner than SWPC/NOAA. I will post up graphs of thier counts sometime in the next day or so. Furthermore, the white-light facular counts are and have been on a footing of a full magnitude fainter than 1911-14. There are no cycle transitions for white-light facular counts equal to or lower than 2006-09, for which counts are available. None. 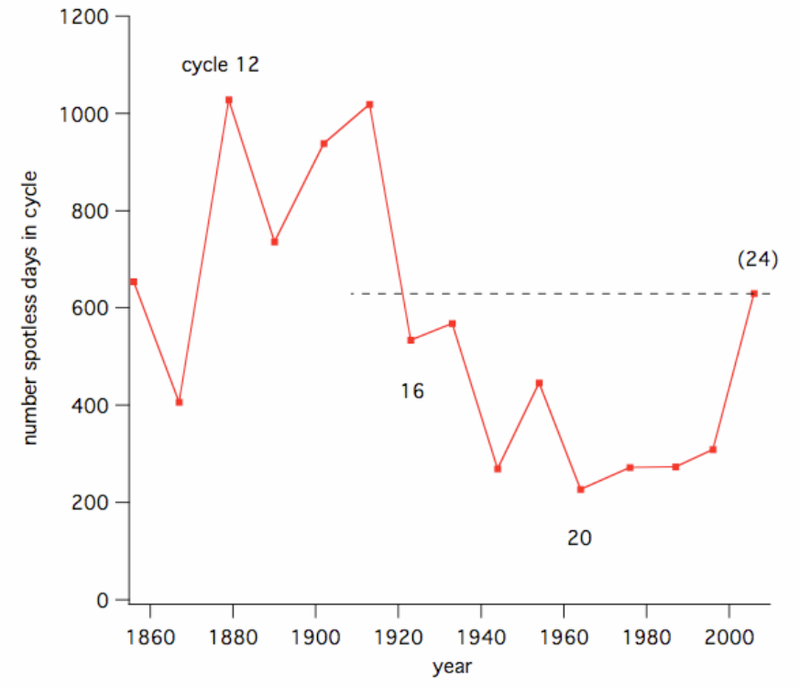 1899-1902 was quieter for 1901, but was shouldered by high counts. I believe that any Grand Minimum is an animal of it’s own character, no two being identical. I sense the abnomality of Grand Minimum, but in it’s own making different from any previous. Not the Maunder, Dalton, Wolf, Sporer or Oort. Wonderful — the year 2015 isn’t that far away. And we shouldn’t have to wait that long to see if this idea is onto something; it should keep showing up (or not showing up) over the next 2-3 years to further solidify these ideas. Should be interesting to see how SC 24 & 25 bear up and how many plage regions show up w/o associated spots (or with very minimal spots). Plage cycles or Cheshire Cat cycles; whatever, these must be the most interesting time in which to be studying the sun. These could be seen with telescopes of the Little Ice Age times…..especially on cloudy days. There is homogeneity in the sunspot record. p.s. seriously, this was a good post! Thousands of demonstrators have rallied across Australia to demand greater government action . . .
Yup, the government will be able to control climate change. As much chance of that as of controlling the sun. Oops, forgot its the same thing. No no no, this article doesn’t hold water… I think these gentlemen simply don’t understand the rules of the game. Wait a second—you formed an opinion of a post about the sun before waiting to see what Leif thinks of it. That’s sort of breaking a rule too… for some. I don’t think so. When they fade out in front of your 70mm refractor that is better than the telescopes of the LIA (25mm- Galileo), they faded out for them also. I had the unsavory honor of attempting to project as spot with Lief that I had clearly seen 1.5 hrs earlier. And we tried twice. When they Cheshire, they are gone for traditional purposes. There is little solace to be found there. In their last analysis on Hematite Stained Grains (HSG), Bond et al logged a peculiar percentage corresponding to the last period of 70 years, which makes the graphs on HSG to go down abruptly since 1935 AD. I could explain the abrupt falling through the current decrease of insolation in the northern hemisphere; however, this could mean that not only the sunspots number has dropped down, but in general the solar irradiance during the last 74 years. I would question the assumption on equaling the sunspots number with the intensity of solar irradiance. It is evident that there is something more over there… Something which have escaped to our observations and satellite sensors. Perhaps the accuracy of the satellites nowadays is so high that it seems that the Sun is spitting the same load of energy than it was before the advent of satellites, when in reality it was brighter and more energetic in the past? The latter conjecture would make some solar students bristle their hairs. I know what I will be told in few minutes… “Hey! Nasif! It’s a conjecture! But I suppose the puppy already has disappeared with the pancake. It was a fizzer. Dominated by a variety of lefty socialist groups. BBC is grasping at straws. What is making the news is the cold weather and the great start to the ski season. Hey, I just Leif on the National Geographic Channel today. He was talking about the sun and sunspots. The program was about diminishing solar activity and previous cold periods. It was a summary of many of the theories that we see, cosmic rays vs. solar wind, sunspots and cooling, etc. If this continues, pretty soon we’ll have negative sunspots. But seriously folks, Someone once told me the sun has periods of boom and bust. The boom has finished. Now we have bust. How long the bust goes on is a matter for debate but these small spots don’t promise a ramping up any time soon. General weakness of polar magnetic fields may be another indicator of the changes taking place. This may be just a coincidence, but if strong divergence (just started) of polar fields before minima is any guide, then this minimum is not done yet. Physical explanations of this deep minimum are at present speculative. Modelers invoke flux transport, meridional flows, and other subsurface mechanisms. Whether this diminished vigor in sunspots is indicative of another Maunder Minimum, remains to be seen. Science remains baffled….just observers really. Those of us in the know are not surprised, its following the script to perfection. Any estimates for the number and size of spots that formed on the other side of the sun? The pink points show the contrast [1 meaning invisible] and the black points the magnetic field. None of these data have been smoothed [I hate smoothing]. The big dots show the yearly averages in an obvious manner. Seems we still have much to learn about the mechanisms driving the sun and it’s interactions with our climate. It is interesting that the reduction in the suns ability to produce strong magnetic fields mirrors the reduction in the Earth’s magnetic field. I wonder if this reduction in electro-magnetic energy is reflected in a reduction in lightening storms across the globe??? if the field strength falls to some 1500-1800 Gauss, the contrast is so close to one that the spot is invisible. If the field strength falls well below 1500 Gauss, the sunspot will appear bright rather than dark. bright spots? Has that actually happened before? Have bright sunspots actually been observed? Had the privilege of visiting the Kitt Peak solar telescope back in ’69. They were still grinding the Mayall 4meter mirror at the time. The solar scope projected an image of the sun that must have been 4 or 5 feet across on a table. Found a page about the Kitt Peak magnetograph and those splitting Zeeman lines. In a sense, yes. They are called faculae. There are many examples of bright areas on the Sun with moderate magnetic fields, but no visible sunspots. Some even recently. Very speculatively: it is possible that during the Maunder Minimum, there was actually significant solar activity [we know, f.ex. that the cosmic ray modulation was strong back then], but that magnetic field was just at or below the 1500 Gauss that makes the spots invisible. Perhaps TSI was even higher then without the black spots to drag down the values. This idea will be strongly opposed by those that for other [non-solar, e.g. anti-AGW] reasons cannot accept such heresy. Excellent post. This is turning into what must surely be one of the most significant science stories of our age. Just out of curiosity, have any of our close stellar neighbours (e.g., the Alpha Centauri system) also gone into “quiet sun” mode recently? Re the “thousands” (or even hundreds!) of demonstrators rallying across Australia this weekend, I also note that Canberra has just had its coldest June day since 1966. Did you not know, Aussie PM Kevin Rudd is the modern equivalent of King Canute. Australia which produces less than 1% of man made greenhouse emissions could go back to the stoneage tomorrow an not make one jot of difference to climate change/global warming even if did exist! It was thought some years ago that a survey of ‘sun like’ stars showed that they [and presumably the Sun] spend about a third of the time in ‘quiet mode’. Later research has shown that this ‘result’ may be spurious as the star sample only included a couple of ‘truly’ sun-like stars, the others were more evolved than the Sun. So the bottom line is that we don’t know. Thanks Leif! I remember reading something about that survey but hadn’t realised that science had moved on a bit since then. OT, but a useful riff in the Torygraph about Herschel, crops, sunspots and the Inconvenient Coolerating of the World (ICW). The text in National Geographic is disconnected (chaotic). Total mish-mash. BTW. A layman’s question. Is there any collation of the most important solar indices (from sci point of view) with attached short comments why they should be concidered together or NOT in making judgements about present and future state of the Sun? That would clarify a little the present state of solar science on WUWT pages. To the advantage of all like me. Thanks. I am still waiting for the moment that a Prime minister or other country leader is standing up in front of the crowd and say’s: There is no Global Warming. The “thousands” reported by the BBC looked more like a small gathering of movie extras compared to the real thousands in Iran demonstrating after their election. Thank you so much, Bill Livingston. I appreciate your work and that you share it here. I cannot imagine more fascinating science. I hope you will continue to keep us updated in the future. I believe you are wrong about that. The fact is there is a lot of money to be made investing in the green -this is not taking sides, only seeing opportunities. Is there information available as to how the sunspot size at the start of cycle 23 compares to that of 24. More specifically, did 23 also start out with a series of tiny sunspots? Senator Brown told a crowd of more than a thousand people [ri-i-i-i-ght, who counted them?] in Melbourne yesterday, the effects of climate change are already here, killing 300 thousand people every year, and costing billions of dollars in lost agricultural production… there’s no hope for the planet unless the global community reduces greenhouse gases by 40 per cent by 2020… The rally was one of many across the country, where people demanded the planned emissions trading scheme be dropped, in favour of a move from coal-generated power to renewable energy. Are there no journalists left who will ask questions?? Or are a politician’s words sacred, like a bishop’s, or a witch doctor’s? Even simple questions like, “Can you tell us how much renewable energy contributes to the total, and how it can replace coal?” And, “Global warming has resulted in a fraction of a degree increase over the past century. How can that small rise, along with a rise in beneficial CO2, result in “lost agricultural production”? Real journalism sinks further into irrelevance. Firstly, thanks to all the real scientists out there at the coal face deciphering the truth for us laypeople. There is so much to learn as this blog and others such as this one http://wattsupwiththat.com/2009/06/10/another-scientific-consensus-bites-the-dust/ have shown. Thanks to everyone who has the knowledge for debating and educating us all. Secondly, thanks to the politicians who try to have a rational debate about AGW. Dennis Jensen MP (Liberal) in the Aussie parliament has tried more than once to have a proper debate about AGW in parliament. There are skeptics out there in our governments. Mr Jensen has a degree in physics and is probably the most qualified person to speak about this subject. He tries! Thirdly, no thanks to the like of Sharon Grierson MP (Labor) in our federal parliament who recently shrieked across the floor of federal parliament during a debate on the ETS “We don’t care about the science!”. That says much for the mentality and motivations of our current government. I’m still looking for a link to the video of that moment or the Hansard transcript. That quote says it all. In the meantime, let’s encourage science to forge ahead and find the truth! There were rallies on Saturday but the photographic evidence is limited and no wide angle shots of the masses are available. This means we must rely on the reports from journo’s at the scene so the reports will be accurate to a fault. Truth be told it was a big weekend of footy with the highlight being the Wallabies v Italy. You will all be relieved to know Australia won easily. I would bet most people in the land of Oz could give you all the weekend sports scores before they could give info on the climate change rally. In the winter unless the weather affects the footy there is a general apathy towards the whole climate change thingy…but then, who really cares? H/u is a report from the SMH. The pink points show the contrast [1 meaning invisible] and the black points the magnetic field. None of these data have been smoothed [I hate smoothing]. You smoothed the data by plotting those black and pink lines through the observations. That differs from the Hodrick-Prescott smoothing (which I love) only in the algorithm, not in the effect, which is present some notion of a trend. I would say they are measuring, not extrapolating, except in a very cautious way, and within limits of some physical boundaries. In particular, look at FIgure 4, and please point out where the extrapolation occurs. b) unless one invokes a new model (with no acting mechanism between the Sun and Earth that I could possibly image) with sunspots forming more (or less) frequently away from the Earth than otherwise there is no scientific justification for assuming that the sunspots on the observed side of the sun have any different frequency or intensity distribution than on the unobserved side. So the current visual measurements are perfectly acceptable samples of the actual total SSN until we have observatories that can see the other side or sense the other side through other means. Over at SC24 we have been discussing the newest Sunspot #1020 which is behaving exactly as Dr. Livingston is describing. This would explain why officialdom is now counting sun-pores, such as the disappearing reappearing alleged Sunspot #1020 which only SOHO can see for one or two hour intervals but has earned itself a count of 12 for over three days now. Yes, Cheshire Cat would nicely describe #1020! Catania, NASA and SWPC are now in the Sunspot fabrication business, the counts are now bogus. One thing that puzzles me about the relationship between TSI and solar cycles is the (apparent) thermodynamic requirement that over the “very long term” the time integral of intensity be equal to the total energy generated by fusion reactions in the solar core. I have read that the time required for energy produced in the solar core to reach the surface is many thousands of years. If true, and if the rate of energy production in the solar core is in fact constant (over less than geological periods), then variation in TSI around the very long term mean could potentially include extremely long period cyclical or chaotic characteristics. This long term variation could in turn produce significant long term cyclical or chaotic changes in Earth’s climate. Perhaps Leif (or someone else with solar science knowledge) could comment on current understanding of the constancy of the fusion reactions in the solar core and the time required for fusion energy to reach the solar surface. Perhaps Dr Svalgaard can answer this question. 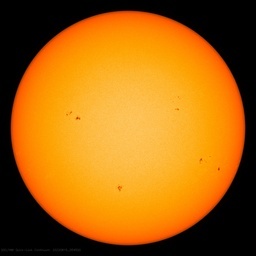 solarcycle24.com has reported 2 counted sunspots in the last few days. These lasted for what seems to be a couple of hours. Indeed the site administrator at soloarcycle24.com was at work and didn’t even get to see one of the alleged sunspots. I certainly didn’t get to see them. Is a hour or two of a tiny tim now counted? The wheels are turning in the MSM in Australia. An independent member of parliament who is holding the balance of power is now seriously questioning the science behind AGW. Professor Ian Pilmer’s book is making waves. The Gods are grinning at us through the clouds. While I’m not certain whether or not I land in that crowd, I’d say evidence of increased TSI during the Maunder Minimum and cooler global temperatures just adds bricks to the edifice of belief that the sun’s effect on climate is not a simple function of TSI, as it so obviously isn’t. If the effect is through clouds, then small TSI changes can be magnified. And if, as it seems from Roy Spencer’s cogitations and measurements, that the feedback is negative often enough for the system to be self-centering, then the mechanism to prevent runaways from the magnification is present also. So what changes the clouds, if not in direction from TSI? Livingston-Penn_sunspots4 comes up with a 404 file not found error. That’s half the Satellite era Andrea. They can only work with the technology available to get the data they have….. I think you are being a bit harsh. …. as Basil points out. They are measuring not extrapolating. These are observations. Real Science stuff… not computer models or statistical “reanalysis” of pre existing data. Christopher Booker has a reference to sunspot activity and crop yields today. I posted a response as feedback but it’s not getting through, Here’s what I wrote. Did I say something bad? Crops respond to Weather not Climate and CB is painting for us a gloomy but factual summary. It is strange, is it not, how imaginative predictions of 300,000 deaths from CC are accepted as fact by so many, while verifiable and factual figures on food-production given here give rise to torrents of scorn, ad-hominem attacks and hubristic pontification. If CB were to tell us that the sun will rise tomorrow then, no doubt, the usual suspects would be out in force and howling him down. What is the problem with the words -“message”,”messenger”- that some of you just don’t get? I get your point… But you actually have the King Canute story backwards. The actual message is that King Canute was sick of being seen as a living God by his people. So he went down to the shore with his subjects and declared that he would hold back the tide…. Of course he failed… Thus he proved to his subjects that there was a higher power than he…. Thus he converted to Christianity as did his subjects. I disagree. I show all of the data, not just a smoothed version. The trend lines are not smoothing [as was not the linear trend in Livingston’s]. Journalists often do that. Not much can be done about it. BTW. A layman’s question. Is there any collation of the most important solar indices (from sci point of view) with attached short comments why they should be concidered together or NOT in making judgements about present and future state of the Sun? 1) Of all phenomena discussed on WUWT, this the most intriguing and worthwhile news, by my fancies. 2) This doesn’t say much that isn’t in http://wattsupwiththat.com/2008/06/02/livingston-and-penn-paper-sunspots-may-vanish-by-2015/ the new paper clarifies some stuff (very welcome) and updates things to the present (very welcome). The old paper has more info on the OH- sprectral lines and other core science and is still worth reading. This is not a criticism! Confirmation that things continue to happen as extrapolated into the future is valuable news. 3) IIRC, Science rejected the paper on the grounds it was too statistical and didn’t propose mechanisms behind what’s observed. Fair enough, but clearly this phenomenon needs to be communicated widely, like a decade before 2015 so it can be studied better. We lost those years! 4) Many, many thanks for everyone behind getting this “in print” first at WUWT. These people make me despair. Why don’t all the warm-mongers out there just get rid of your cars, all your electrical appliances, switch off your electricity, get rid of anything plastic in your house, I could go on…. And how did you all travel to the rallies? Did you use any fossil fuels? Shame on you if you did! Why not show us that you really care by making the sacrifices now? Figure 4 is quite interesting. An alteration which seems unaffected by the 11 year Schwabe cycle, implying a cause which is not controlled by the Schwabe cycle yet its effect is visible within the Schwabe cycle’s spots. In figure 4, I see a dip-and-recover pattern with about a 4 year cycle. 11/3 is nearly 4, so maybe that 4 year cycle is related to the Schwabe cycle. A relationship might be more apparent by comparing the peaks and dips to the sunspot counts during the same period. I see that Xanthakis, Poulakos and Petropoulos, 1992 noticed a 4 year period in one cycle. Also, this summary only mentions measurements taken at one observatory. Have several instruments been used, to reduce the possibility that the decrease is due to the instrumentation becoming less sensitive? Have any measurements been confirmed at other facilities, to reduce the chance that the decrease is due to something at one location? How well would a “camera obscura” work in counting sunspots and defining their parts? Is this taken into consideration when reviewing historical accounts of the very low number of observed sunspots? Since those early astronomers couldn’t measure field strength how can we know if it wasn’t low Gauss that was simply “hiding” the spots rather than there actually being only a few spots? It has a very convincing arguement that the sun is electrical in nature, with a solid iron surface (which is what you see as sunspots). It’s very throrough and uses actual data and images from NASA’s own equipment to back his observations up. Take a look. No, no, no. You have all got it soooo wrong! How do I know? Because the UK Met. Office tells me so. They have mapped out exactly where and when and how the evil AGW and the dastardly CO2 are going to blight Blighty. Don’t know about 23/24, but 14/15 ended and started with whoppers of sunspots. In the deepest (and also the briefest) part of SC14/15 transition, there were tiny tims, but they also appeared in swarms. See all the indications of the Tiny Tim faculae?? Half the average size in SC23/24 as in SC14/15? From a quick scan of data from 1996/97, both the spots and the faculae (white sunspots) were larger than those of today. Perhaps he is more like Nebuchadnezzar II than King Canute. Are any of these changes in the sun related to the step-change in part of the radiation spectrum that you noted in October 2005? and recent changes to sunspot observation can only effect a relative increase in the number observed, not the other way around. My God. A correct use of the word “effect” to mean “bring about”. Perhaps a first on this blog? Please explain to us unlightened many about how a solid iron solar surface has managed to stay hidden these many years from literally thousands of spectroscopic studies? The last thing AGW skeptics need, imho, is for fringe pseudo science highjacking anything. AGW highjacked climate science. We do not need distractions on our side. The sunspot effect can affect us! Your link to the Sydney Morning Herald estimates a crowd of 6000 nationwide. With a reported population of over 21 million people, this means that this mass movement of concerned Aussies was able to turn out about 0.03% of the population to save the word from 0.03% CO2. While I composed a response I seemed to have gotten timed out and had to re-connect. I did the original as a word.doc so it was not a problem. Can it effect such an affectation? The ugly face of propaganda masquerading as a science. Salty ocean currents create the Earth’s magnetic field? Interesting, but could it be the other way round? I am always interested to see what Livingston and Penn (and Leif) have to say here. As said by many before, these are interesting times. the Beer et al Be-10 data shown in their Nature 348, 520 (1990) paper seem to follow quiet well the sunspot activities from 1700 to present. I have only the figure of the Solanki et al Nature 408, 445 (2000) at hand., which show big cosmic ray activity around 1700. 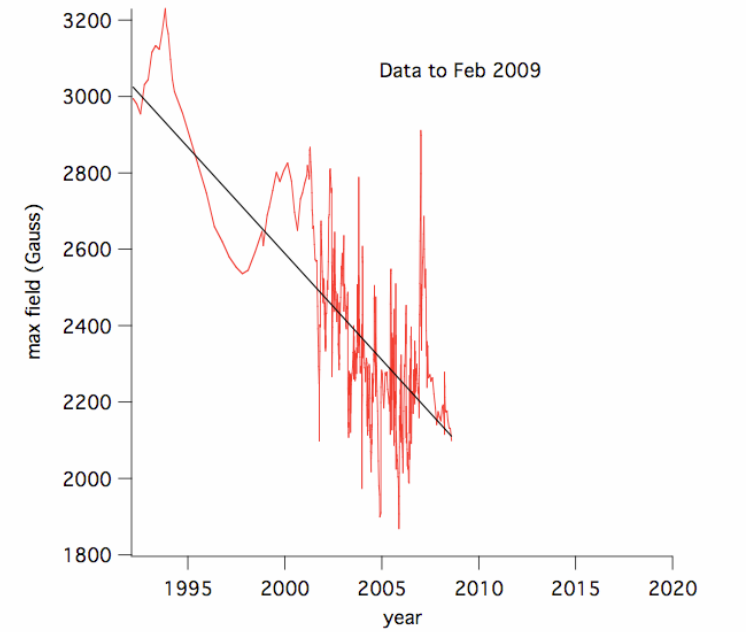 Are there other data, which indicate small cosmic ray activity through the Maunder minimum? Werner Weber-actually, sense cosmic rays and sunspots tend to be inversely related, I think you mean high intensity during the Maunder. If you find it let me know. I will make a YouTube video out of it. What I don’t understand is why SLIOCH, bane of climate realists – cherry-picker of all AGW arguments (and nay-sayer of every and anything that negates the AGW case) and undiscerning disciple of Tamino, does not log on here and destroy all of your arguments. ‘Slioch” for those who have not encountered him,is a term for ‘spear’. He claims to live in the Highlands of Scotland, to have geological training and to be an all-knowing doom-sayer. Obviously, and thanks to genetics, I’m not Leif; there are other data which indicate the intensity of solar irradiance during the Maunder Minimum. As timetochooseagain has pointed out, the intensity of interstellar cosmic rays would be higher during a solar minimum, if and only if Svensmark’s theorem is correct. Notice the abrupt declining of the HSG curve related to the last 70 years. I’m trying to obtain data from North Atlantic sedimentary cores for extrapolating the correct amount of iron stained grains during the last period. Jimmy Haigh (07:34:01) : & a few others “ ..warm-mongers.. ?? Some of you today seem to be wound pretty tightly. All I did was post a note to a news item. It is possible that someone might be interested and have missed it, and, for all I know it may have been a big deal. You assumed, or so it seems, that I was one of the demonstrators and wanted to boast about it. Wrong. I live in rural Washington State in the Pacific Northwest USA. I look at Roy Spencer’s “Latest Global Temperatures” that are from satellites and globally averaged. We seem to be very close to the temperature average over the time period Jan. 1979 to May 2009. From articles and comments I take it that the warming from the El Nino (shown on his chart) of 1998 has now left the atmosphere and generally we are now cooler than the period from about 2001 to 2007 while this occurred. I also believe Earth has been warming since the last major glacial period – pick your favorite date as to when the temperature was the coldest, the ice mass was greatest, the ice extent was largest, or ice was essentially gone from previously inhabited areas. With some stops, restarts, and major reverses this warming seems to be happening still. Thus, it is not unexpected to have temperatures fractionally higher now than in previous years when a long time frame and global averages are concerned. Crops are late in the northern USA and parts of Canada this year as they were last year. While food crops are important I pay attention to the budding, flowering and growth of wine grapes. Growers and wine makers care about such things and keep close track of what the vines are doing each Spring. We do also know that CO2 continues to be added to the atmosphere by natural and human causes. By claiming a lot of wiggle room the AGW group claims the current few years of weather is not out of bounds with respect to the scenarios produced by the models. Fair enough. The Sun is quite quiet at the moment. I don’t know what the portends. Do you? Let’s all chill a bit, have a grilled steak and a beer if you’re a CO2 fan or carrot sticks if you are not. Stop calling each other names. Let dollars and smart people flow to good science and stop wasting resources on ever elaborate extrapolations of an assumption that seems (to me) to be in tatters by science and nature both. That photo of large sun spots I find eery. We are looking into the Sun, through a hole in teh oputer layer, and it is dark! Interestingly, some of the internal layers of the Sun are opaque, to different wavelengths and particles. It is a very convoluted process for energy to escape from the interior of the Sun. My thought is that you are being too literal or even simplistic about what the sensors are showing us. I don’t think we are looking through a hole. However, as you also wrote “ . . . teh oputer layer . . .” maybe you have had one too many and will feel better on Monday. Thanks for all of you that couldn’t see all of the NOAA spots. I was afraid I was going blind. SLIOCH,Tamino, Hansen, Streig and the other guys: do they really exist or are they just Gore sock puppets? I am even beginning to believe that the aninymous Et Al is simply an inside joke by Al’s offspring. Uh-oh … extra-solar cooling!! We’re all going to die, I tell ya; we’re all going to die! No Nasif, no one is arguing that cosmic ray incidence on the Earth does not increase during Solar magnetic minima; Svensmark argues that they produce more clouds in the tropics and increase Erath’s albedo. The theory, and data, on cosmic rays, suggest that this happens every 22 years, not every single 11-year solar cycle but every other. This is due to the direction of the solar magnetic field, which in one dirction favours cosmic rays entering the Earth system from the polar directions, and every other cycle, entering from the equatorial regions … where any cloud formation would have a dramatic impact on albedo, right where it hurts. Now, did you, at school physics, have a toy cloud chamber where you could see atomic tracks due to cloud formation – hence the name of the apparatus? I buy the argument, and reckon that even the slightest variation on albedo has big impact on climate. But, cosmic rays aren’t the only mechanism that forms clouds. And the minuscule inhabitants of that Lilliputian blue speck want to extinguish the Sun? Hahaha, fortunately, I was cold sober at 2 pm on a Sunday iafternoon in Ottawa, Canada. Unfortunately, my digits run ahead of my neurons. …But, cosmic rays aren’t the only mechanism that forms clouds. That will be a great complement of this work by Livingston and Penn. Anyone else see the massive spike on the Oulu neutron monitor. I notice that the pink line is given as “dy = 0.0177 dx” and the black line is given as “dy = -43 dx”. This implies straight lines. However, it appears that the “lines” are actually curves, with a negative 2nd derivative. This is not an optical illusion. I imported the image into a graphics program, magnified it 300%, and plotted straight lines to the endpoints. There is a definite curvature, moreso for the black line. Straight lines would intercept around the year 2020 in both cases. Comments? ‘Slioch” for those who have not encountered him,is a term for ’spear’. He claims to live in the Highlands of Scotland, to have geological training and to be an all-knowing doom-sayer. I’ve never heard of “Slioch” (the person: I’ve heard of Slioch the spear). I’m a geologist from the Scottish Highlands as well. There aren’t too many of us I would think so maybe I know him (or her). Having said that, he/she sounds pretty pretentious so he/she won’t be a mate. LilacWine (16:08:40) : As for video, I don’t know where to find that! I take you have nothing like C-SPAN, 24 hour political video. And it is exactly this “apathy” I see in Australia, New Zealand and the UK which allows our politicians to run roughshod over all of us in the climate change space. As long as the footy is on TV and they can get to beer and KFC, they don’t care and will allow any crackpot ponzi scheme to be implemented. Perth, Western Australia, shivers at 3c, 6c below average. That’s very harsh. I can’t explain – it’s not my study, I didn’t conduct it, nor have I conducted studies on the sun at anyime in my life. I was just pointing out that the site contained a very interesting theory about the potential composition of the sun, with some very interesting, and convincing hypothesis – nothing more. One of the main arguments against these enviro-wacko AGW ninnies is that they do not tolerate or investigate any scientific studies that disprove AGW hypothesis, period. The reasons for this are many, but this principle applies to all science including all existing hypothesis in all disciplines up to this point in time. But I don’t see anything pseudo science there – all he did was take the running images (from NASA) in the iron spectrum and ‘observed’ – you can observe as well. He created his own hypothesis based on these ‘observations’ and other available data. If you did look at the site, and really read the content, it’s convincing enough to at least be studied further, rather than being outright dismissed. I always keep in the back of my mind the ridiculed and ostracized doctor and his wild theory that bacteria causes stomach ulcers. We all know how that turned out. So, please don’t go the same route as the AGW ninnies – science must challenge the establishment or cease to exist as a useful entity. Does anyone know how the CERN experiment to test Svenmark’s cloud theory is shaping up? It’s due to start properly in 2010 according to this. Ah yes , the weekend footy. I seem to remember that in one of the games a player by the name of Anthony Watts was having a blinder. I can’t remember the team he was playing for (perhaps someone can fill in the gap) but it appears he excels in this field of endevour as well. As promised, I have the graphs and the data to properly digest the “Tiny Tim” problem. First, it’s SONNE, not Ergebrisse. My German is terrible, Ergebrisse means Results. Get rid of that greasy Tiny Tim stuff today. No runs, drips or errors. Smile, you’re on What’s Up With That camera. The House of Representatives question time is recorded and I have just spent some time there going through recordings from the 3rd and 4th of June to see if I could find the time stamp of where the remark was made, no luck yet as interjections are hard to pick up out of a room full of snips. Caution, use this link at you own peril. As an Australian I find this link incredibly embarrassing as our parliament question time is a joke. The bottom line is that both parties have managed to avoid any question of the science of AGW and have managed to turn it into an entirely economic argument in that Australia must have an ETS for business and economic security. It’s a George Orwell thing. Pat I agree but is it all apathy or a fair bit of disgust? If you have a look at that parliament video I guarantee you’ll need something stronger than beer. Pat…Psych down, I was kidding. It’s not just the footy we like. Netball is popular too. “With a reported population of over 21 million people, this means that this mass movement of concerned Aussies was able to turn out about 0.03% of the population to save the world from 0.03% CO2. The odds are in our favour. We can do this on our own, just like Kev said. And they thought he was just doubling down on stupid!! As far as we know the energy production is constant [we know of no reason why it should vary] and it does take ~200,000 years for the radiation to reach the surface by a random walk which would completely smear out any short-term variations [e.g. of 11, 22, 172, 200, 1500, … year variations] should there be any. Sunspot counting has never been an exact science and the rules often vary from institution to institution, from person to person, and from time to time, so not surprising that somewhat different results are obtained. A much more physically meaningful is the F10.7 cm microwave radio flux from the Sun, which we have measured daily since 1947. The pink curve on http://www.leif.org/research/TSI-SORCE-2008-now.png show the most recent measurements [since start of 2008]. So what changes the clouds, if not in direction from TSI? Whatever the answer is, it seems premature to presuppose that it somehow must be the Sun. The evidence is weak and often of the wishful thinking art. Illustrates clearly the danger of showing smoothed data, the actual measurements [that I showed a graph of] does not clear;y hint at such variations and I would consider them just noise [not in the measurements but naural variations in the Sun]. reduce the possibility that the decrease is due to the instrumentation becoming less sensitive? Have any measurements been confirmed at other facilities, to reduce the chance that the decrease is due to something at one location? Not really needed because Bill’s instrument is the best there is and Bill himself is the best observer there is. The data is beyond reproach and is not in doubt. What is not known is what causes it, how long it will last, or if it has occurred before in the historical record. It would certainly work if the spot was big enough. Large spots can even [and has been many times] seen with the naked eye. how can we know if it wasn’t low Gauss that was simply “hiding” the spots rather than there actually being only a few spots? We cannot, and the is the tantalizing speculation that precisely this happened during the Maunder Minimum. None of the arguments have any value and the conclusion is completely wrong. You are misusing the term. L&P are not extrapolating anything. They are simply saying that if anybody [e.g. the reader] would extrapolate the trend that … would happen, not that it does happen, or the data they show is the result of any extrapolation. The ocean currents do not create the magnetic field, but do have a very small effect [less than 1/1000] on the [in themselves very small] variations we see in the field. The effect does not go the other way because the oceans are big, but the magnetic fields are tiny. An ant will have a hard time pushing a truck uphill. You are a bit vague on what you mean. Data from various sources show that there was significant comic ray modulation during the Maunder Minimum. See, e.g. this very recent paper: http://www.leif.org/EOS/2009GL038004.pdf of which, BTW, Beer is a co-author. No hole, but we are looking a bit deeper into the Sun because the Sun is a bit less opaque in a sunspot, but is spot is not ‘dark’. It is still thousands of degrees and shines very brightly [only the contrast with even brighter surroundings may the spot ‘look’ darker]. Here is an interesting trivia bit: suppose you remove all of the Sun except the smallest sunspot we can see and left than one hanging in the Sky [like the Cheshire Cat – just to stay on topic] as the only thing left form the Sun? How bright would it be? The answer is: ‘several times brighter than the full Moon”. So the spot is not dark at all. This is due to the direction of the solar magnetic field, which in one dirction favours cosmic rays entering the Earth system from the polar directions, and every other cycle, entering from the equatorial regions … where any cloud formation would have a dramatic impact on albedo, right where it hurts. You misunderstood whatever source you are quoting. the polar/equatorial regions mentioned are those of the Sun, not the Earth. No, there ain’t any ‘massive’ spike. There is a definite curvature, moreso for the black line. Straight lines would intercept around the year 2020 in both cases. Comments? The slopes are just the average slope of the curves [as if they had been straight] to give a feeling for the rough size of the effect. The scatter is so large that the difference between straight and curved is not really meaningful. If you look in an iron line you’ll only see iron, so no small wonder that you see iron. This site is complete garbage, which is as harsh as it needs to be. We should not combat the garbage of AGW with even worse garbage. Ergebnisse. The SSN should be on average 12 times the Group number. Try to multiply the group number by 12 and plt with the SS. No hole in the ordinary sense, but we are looking a bit deeper into the Sun because the Sun is a bit less opaque in a sunspot, but is spot is not ‘dark’. It is still thousands of degrees and shines very brightly [only the contrast with even brighter surroundings makes the spot ‘look’ darker]. Here is an interesting trivia bit: suppose you remove all of the Sun except the smallest sunspot we can see and left than one hanging in the Sky [like the Cheshire Cat – just to stay on topic] as the only thing left form the Sun? How bright would it be? The answer is: ’several times brighter than the full Moon”. So the spot is not dark at all. No he ain’t, Gerard. King Cabute enthroned himself on the seashore to prove to his foolish people he could not hold back the tide. Kevin will not be King until he has the wisdom and humility of Canute. Graph added & page updated. Just want results 18:42:21) and Paul R (22:09:18): Thanks for the clues re the “We don’t care about the science!” remark. I’ll stay on the this for two reasons. 1) If she didn’t say it I’d hate to tell untruths about her. 2) Assuming she did say this, it’s more evidence that points to a social engineering rather than environmental motivation re ETS. As for Aussie parliament? Sigh, it is an embarrassment at times. There can be more ham acting there than a local high school production of Shakespeare. Sadly, science is often an uncredited bit player in the chorus. Looks like a pretty good match, so the simple ‘multiply by 12’ rule holds up well, even with minimal activity, where one would expect it to fail the most. Well, so far so good. I still have to go over 2006-2008. The whole idea, really, is to end this nonsense of assigning unrealistic numbers to glorified pores. They are best treated as fractional spots in time – space. That´s great. So we are going to have the real spotless days count! I have probably mentioned this title before, but __Times of Feast, Times of Famine__ by the French historian Emmanuel LeRoy Ladurie, a must-read text for those interested in the effects of climate on human history, depends heavily on vintage records from France beginning with the 14th c.
As significant as spotlessness, IMHO. I don’t know about real, and my 2 proposals for correcting haven’t generated so much as a single vote. Do you like option (1) or (2) ?? I cannot do anything about a Tiny Tim once it is part of a group #>1 or SSN >4, nor do I wish to. So, without any feedback, I’ll treat you all to Shock & Awe by blowing the most Tiny Tim grit out of the water as possible. Option #1 and spotless day runs. You misinterprete this cautious remark. What he means is that there is very strong correlation between the two [as the Figure so clearly shows], but that there is also some scatter because the Sun is a messy place, and that that scatter is solar in nature and not due to the instrument or the seeing. Nomad is back. He’s weeded 2008 of Tiny Tim Invasive using option #1 (kill all SONNE G# below 0.5 for each hemisphere (and the attendant ssn’s)) Nomad Major. 305 spotless days puts 2008 just behind 1913. Jul20-Sep21 (day202-265 inclusive) is #3 on the spotless day runs list. I’ll run it the other way, just to be nice. Option #2: Kill all SONNE SSN’s below 5 for each hemisphere. Nomad Minor. Option #2: Remove all ssn’s<5 from SONNE list. 298 spotless days and 2008 is just behind 1913. #3 on the spotless day runs list. The F 10.7 flux is down to 67. The Sun is still flatlining. W. Livingston & M. Penn (2009). Sunspots Today: A Cheshire Cat. Thanks and yes, even if it is the sun, we must not presuppose it so. It is a lovely little problem. I hope to live to see the solution, but it may well be a matter of very great complexity. It is not a matter of “belief” just being aware of the scientific evidence and following where it leads. Some call that “compulsion”, in other words, if the scientific evidence is “X”, “Y”, and “Z” then one is “compelled” to come to conclusion “A”. The, above, is a primarily an example of laboratory science. The results of experiments and testing speak for themselves, there is no dispute. In field sciences, this is more diffcult to apply (but still applicable in many circumstances), this leaves deduction which is more problematic. But once a deduction has been acclaimed by “consensus” it is much harder to change as group-think takes over and self-justification of the group overwhelms other contradicting evidence, as a result there is a tendency to ignore contradicting evidence. Surely, you are aware of this dynamic. Total disgust. I thought British politics was a pantomime (I mean it still was/is, look at Thatcher, Blair, Brown etc), but Australian and New Zealand pollies take it to new hights. Not a single one of them has, so far, earnt my vote. New Zealand’s ex PM, Helen Clark, was one of the most highly paid politicians, income relative to GDP that is. Could someone please point me to where I can get polar magnetic field strength data as per this graph: http://www.geocities.com/vukcevicu/PFdiv.gif . Excellent job Leif. I’ve always been a big user of this in regards to forecasting several things from way out. I guess I owe you one. As usual you are ill-informed [or rather, ignorant of the effect of the eccentricity of the Earth’s orbit]. The F10.7 is NOT flatlining; what you think is flatlining is just the compensating effects of F10.7 increasing and the distance to the Sun increasing in concert. I wouldn’t put to much emphasis on lower flux numbers showing up on and off and this is not all that uncommon. Because certain longitudes will become hot spots for extended periods just like some areas become less active. And you can even see these low values show up months after triple digit readings, like we saw during the beginning of Cycle 23. Now I would be more concerned if the entire rotation stayed very low and not just parts of it for an extended period. But we also need to consider this cycles probable outcome, lower level. And the ascending part of the solar cycle is similar to the development of the La Nina and El Nino. It waxes and wanes, 2-3 steps forward, another step backwards…on and on. So patience will be a virtue with Cycle 24. An interesting read. Thank you, Anthony, for the post. And thanks also to Livingston & Penn for sharing with you (and us). At the SPD conference here in Boulder, Janet Luhman gave the ‘Parker Lecture’ and ended her talk with a slide showing her sources. The top three were WUWT, NOAA, NASA, in that order, and a fair fraction of her slides were just lifted off WUWT. I would like to point out, respectfully, that ALL the numbers are low. Relatively speaking, they have all sloughed off. Right now, we have a nudge in one set of numbers, but yet they all are low. We see the real data. We know about the Tiny Tims. We know about the UHI effects and the placement of stations. We know about the issues with Sea Ice Sensors going awry. We know about the oceans filpping cold. We know about crops in stress and late planting seasons. We don’t know what tomorrow brings, but we surely know about the reluctance of the system to bust out of it. Ever since I started doubting the AGW hypothesis (shortly after Gore’s inconvenient “truth”) I have been looking at the sun climate connection. Since sunspots seem to have a connection to global temperatures and at the same time there is not a huge difference in solar irradiance between times of solar activity and quiet, the obvious culprit seems to be solar faculae. These in turn are connected with solar wind. It is solar storms and wind that directly hit the Earth that would effect our climate and not those that whizz harmlessly by, into space. Of course more would be expected to hit the Earth if there more around, which happens when the sun is active. Apparently one Theodor Landscheidt (deceased) forecast in 1989 a period of sunspot minima after 1990, accompanied by increased cold, with a stronger minima and more intense cold which should peak in 2030, which he called the “Landscheidt Minimum”. Whereas I was quite disappointed to read that he dabbled in “astrology”?, I read his paper on the Solar Wind – Global Temperature connection and it seemed to make a lot of sense to me. Particularly he points out a 6 year lag between solar activity and global temperatures. He also points out that CO2 forcing fails to halt the fall of temperatures due to an inactive sun, which should be obvious from ice-core data, as rising CO2 levels have invariably failed to halt the recurring ice-ages. I do know that the coronal holes are associated with the high-speed solar winds, but I don’t know too much about the low-speed winds being closely assosciated with the faculae. Right now, the faculae are in about as bad a shape as the sunspots. Since counting of them changed hands and left a big gap, I get a fuzzy picture of them decreasing over the last 2 decades or so in relative sizes. Greenwich/USAF network dropped out in 1982. Archived data available. SONNE picks up in 1996 and has onsite data. but has no onsite data. Funding was canceled in 2005 but some have graciously kept it updated. Even up to April 2009. On another note. It looks like a new region is starting to emerge in the SW hemisphere. I guess it was to late in the day for the SWPC data but maybe they count it tomorrow if it sticks around. That ‘some’ is my good friend, the much vilified David Hathaway. This sounds reasonable. On a daily basis the maximum and minimum temperatures are reached after noon and midnight and the coldest and warmest months are after the solstices. For the Earth on a decadal basis there should be a considerable lag from solar influences due to the ocean heat sump. Landscheidt claims “..Near-Earth variations in the solar wind, measured by the geomagnetic aa index since 1868, are closely correlated with global temperature ( r = 0.96; P < 10-7).." The graph showing smoothed yearly aa index against smoothed yearly global temperature anomalies is also very impressive. 1st col. is the year, 2nd col. is the raw aa-mean, 3rd col. is my corrected aa. Basically aa+3.322 before 1957. Why? See: http://www.leif.org/research/2007JA012437.pdf page 15. The 2.9 nT correction becomes a 3.322 nT correction after the effect of the dipole tilt has been accounted for. 1st col. is the year, 2nd col. is the raw aa-mean, 3rd col. is my corrected aa. Basically aa+2.531 before 1957. Why? See: http://www.leif.org/research/2007JA012437.pdf page 15. The 2.9 nT correction becomes a 2.531 nT correction after the effect of the dipole tilt has been accounted for. That effort, unfortunately, does not include the data I seek: White-Light Faculae. Any chance I might be able to see a part of it? Vukcevic has a formula that will give you the polar field at any time thousands of years in the future or in the past, so you don’t need observations. …….. Thanks for publicly ‘endorsing’ Vukcevic polar fields formula, a cynic would add “no such thing as bad publicity”. That ’some’ is my good friend, the much vilified David Hathaway. vilified ? ….Ouch. I appreciate his updates. Sorry , I guess I should have mentioned that. It was also for others to look at for other information. As far as the cycle trends (peaks) during the last few, and what your looking at. It’s been dropping since Cycle 21. The peak values of Cycles 22 & 23 were somewhat in the same ballpark with each other but the consistency of Cycle 23 was not as strong as Cycle 22. Although the descending part held it’s own. Leif: Could all of these Solar Cycles be related to a cyclic mass balance going on within the Sun? i.e. A solar tide if you will together with mass being destroyed and energy being created from this? I found it on Wikipedia and whoever edits that says the cycle is due to the differential rotation of the sun produces twisted magnetic fields in an eleven year cycle. Could it be that there is some kind of wobble or other long term explanation for this differential rotation of the Sun? Interesting and of course we don’t have enough data to figure this out yet. @Dr. Leif Svalgaard… Leif, I’m trying to calculate the mean TSI for 2008, but my ciphers don’t coincide with the average that you calculated. I took the database from SORCE-TIM; however, SORCE’s database shows very low magnitudes, as 1360.5 W/m^2. Please, would you be so kind as to give me the formula for converting SORCE data to real data? I thank you in advance for your kindness. Could it be that there is some kind of wobble or other long term explanation for this differential rotation of the Sun? Interesting and of course we don’t have enough data to figure this out yet. The differential circulation is caused by several things, including the Coriolis force [the same process that creates the Trade Winds in the Earth’s atmosphere. The magnetic field also modulates the differential rotation [makes it less]. But the true relationships are only now beginning to be investigated, now, when we are beginning to explore the interior of the Sun observing the results of Sunquakes. Please, would you be so kind as to give me the formula for converting SORCE data to real data? The SORCE data is the real data. It is the other data that is wrong [too high by ~4.4 W/m2], but for consistency with older data it is more convenient to ‘correct’ the SORCE data. As long as one knows that that is going one, there should be no confusion. Many thanks for that data. I’ll have a look today after work. May be Leif can chime in. Anthony have you seen this yet? The mirror image like similarities between the jet stream in both hemispheres, especially at the higher latitudes, is remarkable. It is not. the piece is just usual NASA PR-hype. We have not solved the problem, just moved it: namely to why has the flow slowed? The similarity is simply because this is a GLOBAL inversion that assumes [and forces] the two hemispheres to be identical. Maybe remarkable was the wrong adjective to use but let’s push the differences aside within your community. And I’m probably on your side here anyway. So are you saying that it is not somewhat odd that both hemispheres almost look like mirror images even though the surface on both do not throughout the solar cycle ? And I was really talking about the one at 4,000 which you could access in the article….”more graphics”. Thank you for adding the extra minor details and if I have any more questions, or comments, I’ll post them in the other discussion. You left open the issue of your understanding of why there should be an EXACT mirror symmetry and that it is solely an artifact of the presentatation and the analysis and NOT a property of the Sun. Do you now understand that completely?